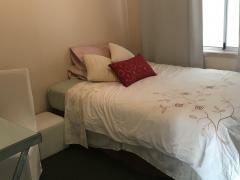 Our home is located in the heart area of Sydney, the 2rd CBD of Sydney, 2mins walking distance to the Train Station, 10mins away from the Shuttle Bus Station, supermarkets, restaurants, banks, etc. all surrounded. No matter City, UTS, Townhall, Maquarie Uni, or Penrith, Blacktown, Carlingford, North Parramatta, West Sydney Uni, even Liverpool, Campbelltown, are all easy to reach. Our home has 3 bedrooms, 2 living rooms, 2 bathrooms, 1 fully equipped kitchen, and 1 large sunshine balcony. Enough personal space for studying & living separately. We all have plenty of experience in the childcare, early children training, juvenile teaching, even nutrition field both in Australia & China. 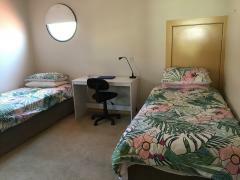 We plan to support a second bedroom to 1~3 students or new friends, female only. We try to keep the room clean & aim to practice a culture of honour and respect by maintaining a clean and tidy environment for all our housemates. The basic rental payment is $260. We can also supply daily breakfast, dinner, other services with extra money, such as other dinners, sometimes family dinner together, Chinese yummy dishes during some Chinese festivals, local traditional dishes, and so on, airport pickup, tourism, etc. Safety, harmony, friendly, not noisy, normal wake-sleep hours, and no bad habits are the most important things in our family. Me, Michael, a civil engineer, construction project manager, a professional teacher in kindergarten and elementary bilingual schools; have travelled all over the China, & been to dozens of foreign countries, from Japan, Korea, Singapore, Malaysia, Indonesia, Thailand; to Turkey, German, Portugal, Canada, New Zealand, etc. Jennifer, local lady, childcare teacher, engaging Dietetics Professionals in the children & adolescent fields. Jennifer's daughter, Grade 7 student at school. Sydney, a lovely female Ginger Kitten, 5 months old, naughty & cutty. We have received friends almost all over the world, from Vietnam, India, Indonesia, to Chile, Italy, Tunisia, Egypt, Russia; most of us have become good friends & still keep connecting with each other. Why not to join us now?